Monogram paisley lunch tote bag. Paisley is a timeless design that never fails to appeal to fashionistas. Carry your MasterChef inspired sandwiches to work, to an outing, to the gym or to the library in this classic lunch tote. It has a wonderful paisley pattern in bold colors set against a sea-blue background. Hot pink handles add a wow feminine look. 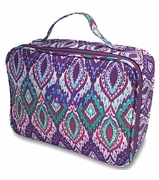 The tote has a zippered compartment and will stand upright on a flat base. The matching paisley backpack can be purchased for a matched set, search item SWT-606PAISLEY. 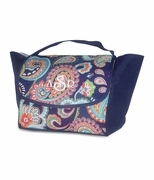 Paisley lunch tote measures 10.5W" x 7"H and six inch wide bottom. Open slash compartments on both sides of the tote bag are perfect for keys, cell phone and ID card.